Training for a project is like a mixing a great cocktail. A variety of ingredients, well-synthesized and carefully planned will yield great results. In this article we’re going to go over the different bases, modifiers, and huge cocktail-shaking forearms you need to make the ascent of your goal route both smooth and delicious. Let us start with a quick exercise. 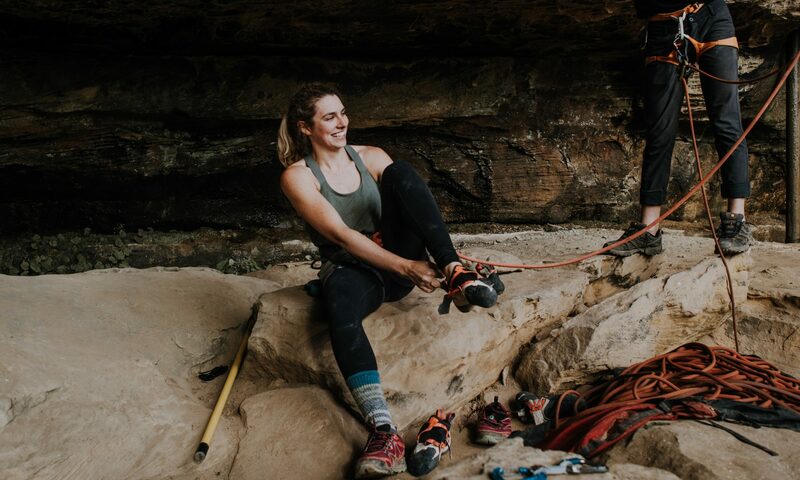 Grab a beer and enjoy the short film below of Michaela Kiersch sending Golden Ticket (14c) at my [former] home crag–The Red River Gorge. For starters, this route is 85 feet tall and has many challenging moves and holds. Note that Michaela has the endurance to deal with marginal crimps for all 85 ft. She has the power and strength to accomplish the move, recover from it, and clip the anchors. In addition, she has to have the stamina to try this route many times in one day since she is in school and is only able to make it down to the crag on the weekends. 1. Be able to do all of the moves. 2. Be able to link all of these moves together. 3. Have the capacity to make put in multiple burns on it in one day since she is short on time. *Note that my training and goals are primarily for single pitch sport climbs, at this time. The cruciality of these components will vary for other styles of climbing. By definition, an antagonist muscle is a muscle that directly opposes another muscle. In climbing, we use all of our muscles; however, climbers tend to overdevelop certain muscle groups. Therefore, a good program will have you develop the lesser-used muscles. Read more about antagonist muscle strength from The Climbing Doctor! My try-hard face while I engage too many different muscles in this hanging leg raise. Whether you are too pumped to clip at bolt 3 or at bolt 11–if you don’t have the endurance to recover from the crux and finish the route, you are never going to send. Building up your low-end endurance capacity is important. See Guide to Endurance Training for more details. Let’s talk physics. See equation below. Now let’s look at a practical example from my personal life. Bouldering at my limit to increase power. My boyfriend, Mike, is very tall–about 6’3″. He is able to reach things that I cannot and thus, some moves work better for him when they are done statically. I am not tall, and there are some holds that I will not be reaching unless I start moving dynamically. A good training program will set you up to increase your power so that you can efficiently do those big powerful moves on your project without letting one big throw bust your whole send. *if we are being extra nerdy, technically Mike has more mass than me, so technically he has done more work than I have. However, let’s not get too detailed. This is where things get whacky. Experts get into debates all day about whether or not power endurance is even a real energy system–this is fine. As climbers, I think the term “power endurance” is a term that makes sense to many of us, so we are just going to take it and run with it. Let’s look at another example. Climber A can climb v8 in the gym. Once he tries on it for a week or so, he can get warmed up, rest properly, and do the problem. If he wanted to do it again, however, he’d have to wait at least 5 minutes to rest and he may or may not have the capacity to do so when he tries again. Climber B can also climb v8 in the gym. However, climber B has a different rest requirement to do this problem. She is able to place this problem in a circuit. Climber B can start on this v8, climb down a v3 to recover, stay on a jug for a nice, active rest and do the v8 again. Both climbers exhibit the power to do the moves on this problem; however, Climber B has the power endurance to repeat these powerful moves without a full resting recovery. Climber A does not. Power endurance is the ability to exhibit near-maximum power over and over again. It is the ability to maintain a prolonged display of near-maximum power. A quality training program will also focus on improving this element of a climber’s skill set. If you want to learn more about this, give TrainingBeta Podcast Episode 101 a listen–one of my favorite trainers, Steve Bechtel, explains power/strength endurance very well. At its core, climbing is a skill sport. If you want to get better at it, you will not do so by doing tons of pullups. You must learn lots of moves and hone your skills to improve as a climber. I think this point is summed up very well by Eric Horst in his book, How to Climb 5.12. The best climbers [climb at] an exceedingly high level because they have internally programmed gazillions of different moves that are on call at a moment’s notice. Essentially, you can be great at hangboarding, campusing, and doing pull-ups, but if you never improve your technique you won’t be getting better at climbing. A well-planned training program has plenty of on-rock time in which you can hone your skills. If you are run-down, your shoulders feel like trash, and you slept three hours last night, you aren’t going to be performing or training optimally. However you train, the first priority should be to avoid injury. Generally, if you can’t climb you can’t get better at climbing. Last spring, when my work was getting particularly gloomy, I decided to spend my lunch time sprucing up the cork board above my desk. I needed a reminder of why it was worth it to drive an hour from work to get to the climbing gym to train. I knew I had to stay motivated and go climb, though sometimes all I really wanted to do was smash the jelly doughnuts in the break room and take a nap. To ward off the dreariness, I printed out whatever google images had available for the routes at the Red River Gorge that I was excited about. When my coworkers would ask me what I was up to over the weekend, I would point to one of the pictures on my desk , smile really big, and say “I’m gonna go bag this route”. Me, super psyched, at the end of a day where I sent a project that had previously landed me with a few staples in my head the season before. And I did. It was a blast. Each weekend getaway to the red would yield another tick–I would take the route’s picture down as soon as I sent it, and pin another on the board. They say “never lose sight of your goals” so I made sure to put my goals where I could see them everyday (even sometimes on the weekends, unfortunately). Choosing a route, or a handful of routes to train for is far superior to saying “I want to send an 11d outside.” When training, it is good to customize the program with the goal in mind. With the variety of terrain that can be classified as “11d”, it is more beneficial to choose a specific 11d, be aware of the cruxes on the route, and keep the unique challenges of this route in mind as training progresses. Sure, I would love to climb 5.13d, but my hardest onsight is a 5.11a–so it would be pretty stupid to start trying to work a 13d, wouldn’t it? In How to Climb 5.12, renowned trainer, Eric Horst, recommends choosing projects that are approximately, 4-6 letter grades above your hardest onsight. (Keep in mind this is in terms of single pitch sport climbs). Additionally, training programs are a relatively short-term commitment (8-12 weeks)–it is important to choose goals that congruent to the timeline of training. If the goal isn’t getting you psyched before you start training–it definitely won’t keep you motivated when you’re in the middle of a tough workout. Pick something that, when asked about it, you want to launch into a full cinematic Reel Rock interview about how stoked you are to do this thing. In summary, goals that are specific, attainable, and inspiring are a solid basis for a training program. Clear, stoke-inducing objectives will keep you motivated, even when the going gets tough.